Joni in the Spotlight Stamping: TAKING THE POLAR PAPER PLUNGE! Well here we are! The Paper Plunge day!!! And it's soooooo cold here in Massachusetts!!! Everyone (including myself!) is having so much fun with the cool spring items in the Occasions Catalog!!! But today I have to say I went winter! As I post this, we are -2 degrees F!!! lol Spring seems a long time away!!! 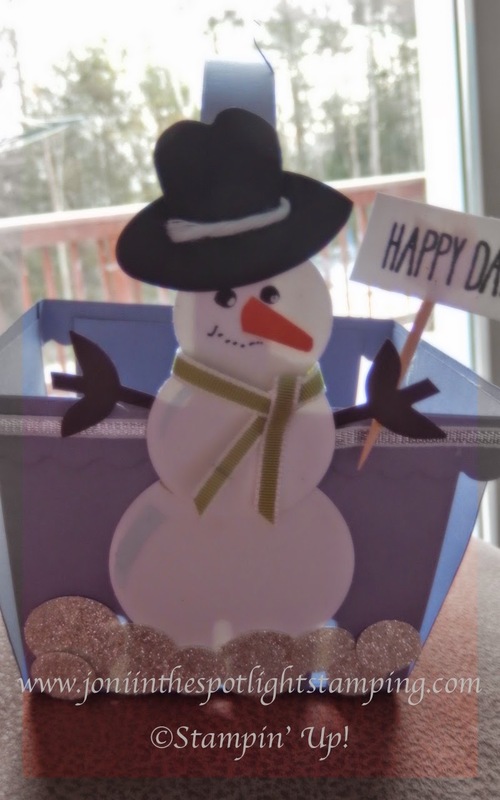 But I DID have a blast making this adorable little project! Not much stamping, but lots of fun! This week's challenge was to use a die to create your project! I used several!!! So no, not a card! I've been "die-ing" (see what I did there? lol) to use the new Berry Basket Bigz Die I got!!! I can see so many uses for this die! And it's one of the easiest 3-D die items I've ever made!!! You can use it with or without the handle. 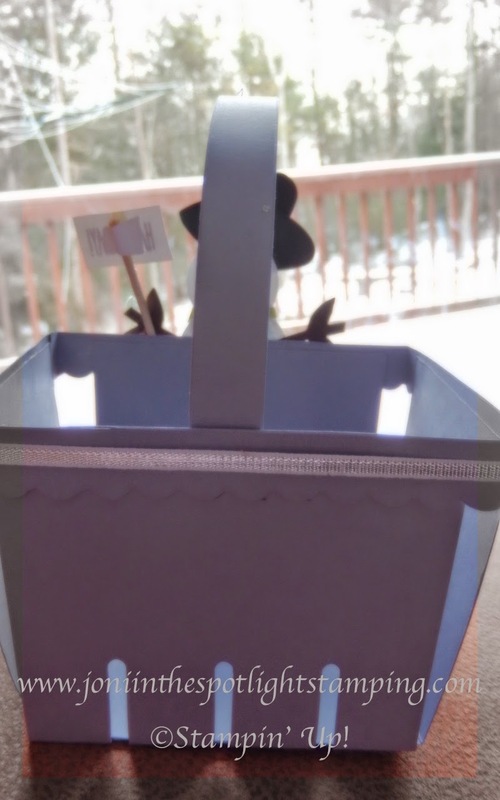 Apple baskets, Easter egg baskets, party favors, etc.! 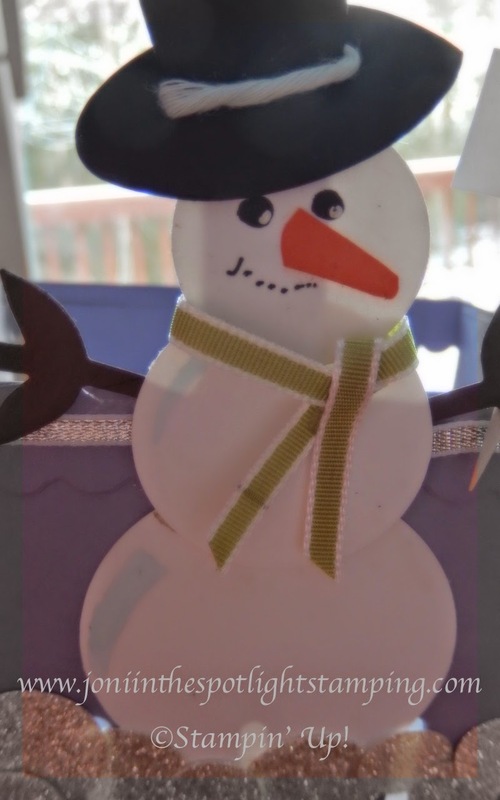 So the little snowman is made mostly from my Circle Framelits. Altho his head is a Circle Punch. Bouquet Bigz Die! I used one of the petals for the hat part & one of the leaf ovals for the brim!! The arms are made from the leaves on the die!!! Perty cool!!!! I just love the way he came out!!! The sentiment is from the adorable Cheerful Critters stamp set! Can't wait to get more use out of that one!!!!!! So be sure to head over to The Paper Plunge & see what the other designers have in store for you! Lots of amazing stuff!!! You have 1 week to add your die cut design!!! Or just use the ones there for inspiration!!!! Enjoy!